When you need work done in hard-to-reach areas, an articulating boom lift like the JLG 60ft model will give you easy access to otherwise unreachable spots. Sometimes referred to as a knuckle boom because of the motion of the boom sections, the articulating boom’s bendable sections give the machine the strength and agility to work around obstacles and tight areas. JLG has been a top producer of access equipment for decades, so you can be sure that when you’re working with a JLG boom lift, you’re working with the best in the business. The company is also a leader in the production of environmentally friendly equipment. Here’s a look at the top boom lift for 2018, the JLG 60-foot electric articulating boom lift. With a platform height of 60 feet and 4 inches, the JLG 60-foot electric articulating boom lift has a narrow chassis that will allow for easy maneuvering in small spaces. The environmentally friendly electric boom lift works well for flat slab and indoor applications. Non-marking pneumatic tires keep work surfaces clean. A tilt-light and alarm alert the operator so that hazardous situations can be avoided. Automatic traction control and all motion alarm increase operator safety. This boom lift unit has a 6-foot articulating jib, operator’s tool tray, and 110V AC GFI electrical receptacle in the platform, making it an easy lift to work from. The inward, self-closing swing gate is a convenient safety feature of the JLG electric articulating boom lift. This model also features a platform control machine status light panel, a battery condition indicator, an SCR automatic battery charger, and a removable battery box. An oscillating axle, lifting and tie-down lugs, hour meter, and manual descent round out the unit’s operational features. 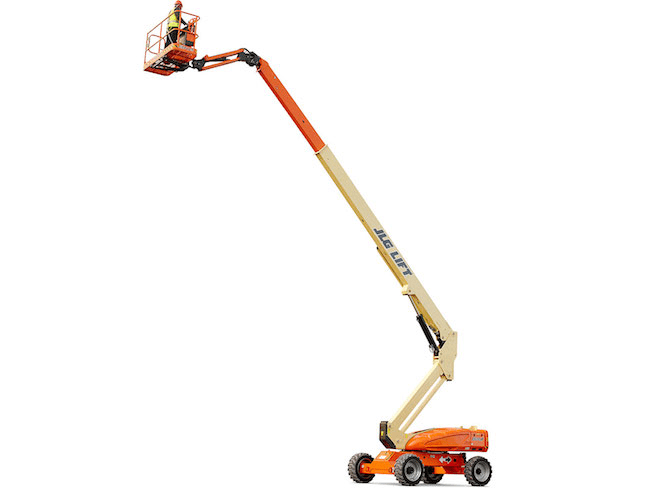 The JLG 60-foot electric articulating boom lift has a platform height of 60 feet and 4 inches. Articulating booms generally have a horizontal outreach of 50 to 75 percent of the vertical lift height. This model’s horizontal outreach is an impressive 43 feet and 3 inches, which is one of the reasons why the JLG 60ft electric articulating boom lift is the top boom lift for 2018. The jib can be rotated 180 degrees, making it easy to get the platform into the precise position you need to get the job done. This unit has 400 degrees of non-continuous swing and a platform capacity of 500 pounds. The 3-mph drive speed gets the machine to the work site efficiently, while its 52 psi of ground-bearing pressure makes it suitable for a wide range of job requirements. When you use an electric boom lift, there are zero emissions, so it’s environmentally friendly and safe for indoor use. These units are also very quiet so you can minimize noise at the job site. The JLG electric articulating boom lift’s electrical system is 48-volt DC. There are eight six-volt, 415 amp-hr batteries. The boom lift has dual electric traction brushless AC motors. Its hydraulic system has a 15-gallon capacity with a series-wound motor and gear pump. This JLG electric articulating boom lift has a width of 7 feet and 11 inches. With the boom lowered all the way down, the total length of this unit is 30 feet and 9 inches; the height is 8 feet and 4 inches. With an inside turning radius of 4 feet and an outside turning radius of just over 15 feet, the JLG electric articulating boom lift gives you good maneuverability for a 60-foot model. If you’re looking for an electric articulating boom lift to use for an upcoming job, you can be sure that using a trusted brand like JLG will help your work go smoothly. JLG has been a leading manufacturer of access equipment like articulating boom lifts since 1969. The company is based in Pennsylvania. JLG has five manufacturing plants in the U.S., with production locations also located worldwide. If your business has a sustainability commitment, JLG is the go-to brand for green equipment. Renting an articulating boom lift is a cost-effective option that can help get your job done safely and efficiently. When you have a job to do in a difficult spot, only an articulating boom lift will do. Since the boom can bend into multiple sections, you have the ability to reach up, over, or around obstacles that may stand in the way of your work. With its long list of outstanding features and exceptional performance, the JLG 60-foot electric articulating boom lift is our top boom lift for 2018.